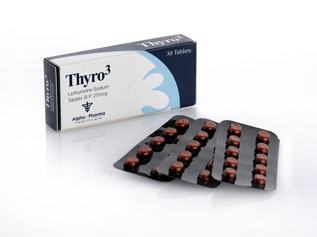 Cytomel is a thyroid hormone designed and developed to treat hypothyroidism. Hypothyroidism is simply a condition where adequate thyroid hormone(s) are not being produced; commonly this can be caused by an iodine deficiency, as well as pituitary malfunction among other causes but it is a condition that is quite common. Through the use of Cytomel we can increase the amount of thyroid hormones we have in our body, most notably the Triiodothyronine hormone commonly known as T3. The Triiodothyronine hormone is responsible for many functions, most notably metabolic activity but it also plays a role in bodily growth and the heart among many others. As T3 is produced by the pituitary gland its mode of action in terms of development and release is regulated by the thyroid-stimulating hormone (TSH.) Once thyroid hormones both T3 and T4 reach a certain level in the blood production is decreased as increased levels block TSH from being released; however, once the levels fall TSH is again released and more T3 and T4 is produced. By supplementing with Cytomel we actively increase the amount of T3 in our body far beyond what natural TSH will allow. T3 is responsible for regulating the rate in-which energy is burned in terms of both nutrient intake, as well as stored energy. By introducing Cytomel into the body, a synthetic form of the T3 hormone we increase this rate; in very simple terms Cytomel or T3 feeds off of raw energy and as levels increase more energy is needed to meet its needs. This increase in energy feeding results in producing greater metabolic activity; as stored body-fat is stored energy it begins to burn at a faster rate as the amounts of the T3 hormone increase. However, it is important to note when T3 levels increase the energy demands must be met and they will be met one way or another. This simply means both fat and muscle tissue can be used as this energy source; while fat will be the primary focus, if adequate measures are not taken when consuming Cytomel muscle tissue will be burned as the Cytomel will get what it needs by any means possible and will not discriminate. By taking Cytomel we greatly increase protein efficiency; however, we also increase the rate in-which protein is broken down. Due to this fact adequate amounts of protein must be taken in but this is good news as even though we require more than normal each gram is now being utilized to a far greater degree. Further and this is of the greatest importance, when we take Cytomel we increase the rate in-which glucose is metabolized by increasing the rate in-which glycogen is broken down. The faster this occurs the sooner the body is required to rely on stored body-fat for an energy source. Further and of equal importance, by taking Cytomel we increase the rate in-which cholesterol is broken down; all of these things greatly aid in increasing the rate of lipolysis. As is with all medications Cytomel does carry with it potential negative side-effects, however many of the side-effects commonly associated with this medication are of little truth but some do exist. The blatant obvious negative effect is undoubtedly the loss of muscle tissue; as many performance enhancing athletes use Cytomel in an aid to lose body-fat they do so on a calorie restricted diet, because of this low consumption of calories, if adequate amounts are not in place muscle tissue will be burned. For this reason, a performance enhancing athlete will never take Cytomel without anabolic steroids, ignoring this rule will assuredly result in the loss of a vast amount of lean tissue. Beyond this possible negative side-effect others do exist but they prove to be very individualistic, dose dependent and in many cases very rare. Possible side-effects include most commonly, headaches, insomnia and excess sweating. Many women who use Cytomel may also find their menstrual cycles disrupted, however, this is often to be expected when body-fat becomes extremely low. A common myth revolving Cytomel is that it will damage your thyroid production beyond repair and while it is possible for this myth to hold a small amount of truth it is generally far exaggerated and borne of fear. While extreme Cytomel use for an extreme amount of time may have a damaging effect there is no hard proof, however, we do know that Cytomel can be used for decent lengths of time, up to nearly a year with no permanent damage being done to the thyroid. However, most will never find a need to use any thyroid medication for this extended period of time unless they already suffer from some level of permanent thyroid damage. Nevertheless, make no mistake, the use of Cytomel will prevent your thyroid from producing its own natural T3 hormone but it will recover full capabilities in most all cases in a mere 2-3 months once use is discontinued and often sooner in some individuals. We have established that as a performance enhancing athlete Cytomel is to only be used in conjunction with anabolic steroids and never alone as use alone will in-fact result in a loss of muscle tissue. With this in mind the next question is when is the best time to use? It should go without saying that during cutting cycles such as a competitive bodybuilding cycle is the best time to use this medication and common practice is to use Cytomel the final 6 weeks of competition to get rid of that last bit of fat; however, it can be successfully used for the entire duration of a diet but one will need to keep an eye on tissue loss if this path is taken. For most a cycle of Cytomel that is in the 6-8 week range will prove to be all the Cytomel they’ll ever need. As for the amounts, generally 25mcg per day is a good place to start with increases of 12.5mcg being applied as needed. This protocol includes Cytomel cycles for both men and women; however both will necessarily keep the dose as low as possible and only increase as needed. Most men can increase their dose safely to 150mcg per day while women will necessarily keep a maximum dose at 100mcg per day. In either case, learn to listen to your body, learn how to accurately observe your body and the effects and if you do you’ll find your Cytomel use to be more enjoyable and effective. There is a final note that will prove to provide a great benefit in thyroid recovery after use is discontinued; easing into recovery is far more beneficial than a cold turkey stop. There is no need to gradually ramp down but rather simply drop your dose down to the original starting point of 25mcg every day and hold for approximately two weeks. By following this method you will ensure your thyroid begins production sooner than later.